Here is a lovely prayer that one of my friends from school sent me the day after my consecration. It is attributed to St. Clare, although I don't think we know for sure that she herself wrote it. Still, it captures my own feelings marvelously. 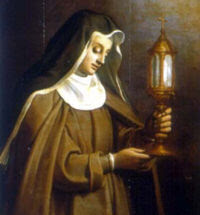 Even though I don't think St. Clare was a consecrated virgin in the strict sense of the term (that is, having received the Rite of Consecration--obviously, she was a virgin who was consecrated by religious profession), I have always admired her for the totality with which she “fell in love” with Christ.